Why: Because we want to see you. We held our first meeting in February 1981. Can you believe it! Please bring a small bowl or plate of finger food and A ROLL OF NICKELS. It takes five nickels perround so you need enough nickels to stay in the game. Beverages will be provided. RSVP Joan. In regard to going to a library program for the new Silicon Valley Reads book, The Distant Land of My Father, Shirley contacted the Evergreen Library. She was told that on Wednesday, February 6, the author will come and ready from her book and then there will be a discussion. It starts at 6:30PM All dates and info are on the website at www.siliconvalleyreads.org It might be a good start for those of you who will be reading this book for your book clubs later and those of us who are reading this book now. Betty went to hear the author interviewed recently with my book club. She said, "Very good interview. It was an interesting, enjoyable and informative evening. It was great to find out where she got the idea for her book. Well worth going to. It really makes you appreciate the book even more. I highly recommend going to see her in person." Your $10 dues should have been sent to Vicki by the end of January. We'll be publishing a roster for those whose payments are current. Those who haven't paid will be dropped from the Las Madres email group by mid February. January Meeting Update: Sally was busy in the kitchen getting the potatoes ready and it was a huge success. Plenty of fixings to put on top of our spuds, and the salads and Merilee’s Lemon Mold were perfect compliments. The berry cobbler (berries from Sally backyard) and the mini éclairs were a great finishing touch to the meal. Sally again was busy cleaning up in the kitchen while we were planning dates. Not hard to do, since her kitchen remodel turned out so well. Love the cherry cabinets Sally, and thanks so much for hosting the ever so important January meeting. Lots of planning was accomplished, but of course still some dates that could use your help filling, both meetings and activities. Also suggested to invite the Young Adults to some of our activities, like Roaring Camp and Napa . Voice your opinion if you think not. If there was anyone there that has a suggestion, even if you don’t want to plan/host, let us know. We’re looking for some possibly new to do either as family, couples or just the mom’s. Any interest in another guest speaker for the couples? Let me know and I can research some ideas. Possible interest in the fall ladies trip to S.F. How’s that sound? Or Pacific Grove ? The exchange went well. Big hit and the biggest item was the wooden salad bowl. I think everyone was thinking much smaller this year. Everyone who wanted to take something home did, and they were happy to have something they actually wanted. Los Padres Golf Weekend to be announced. December ?, Christmas Party @ Merrilee's? Please let the editor know if anything on the list is incorrect or left out. Sue Ballard found the form to fill out to get into the lotto to have a tree in Xmas in the Park. The drawing will be available on the website around October 19th. The requirement is to have 60 ornaments on the tree. They provide the tree, a couple of strings of lights, and the sign with our name on it. The ornaments need to be imaginative, and weather resistant, and the skirting or decorations under the tree has to be within a 2 feet radius. We can choose to decorate either Friday, Nov 28th from 9 to 12 or Saturday, November 29th between 9 and 12. We have the option of removing decorations on January 2nd from 9 until noon or they will be disposed of. Maybe at the February meeting we can decide if this is something we think we want to do or will have enough ornaments to decorate. Jacob Verhoeven has decided to get out of the military. February 8th will end his eight years in the Navy, working mostly at a medic with the Marines. He has not yet decided what he's going to do now that he is out----one decision at a time. The next chapter begins. Does anyone know the whereabouts of the “piggy box”. If you do, can you please let Sue Butler know, in case she needs it for a fast, easy meeting night. We have plenty of spots and most of ust will probably go from July 25th on. The sites are available starting different days, depending on what we could get. "You may visit this store ONLY ONCE! There are 6 floors and the value of the products increase as you ascend the flights. You may choose any item from a particular floor, or may choose to go up to the next floor, but you CANNOT go back down except to exit the building! On the 1st floor the sign on the door reads: Floor 1 - These men have jobs. Then, the store's owner opens a New Wives store just across the street. The directions on the door are the same. 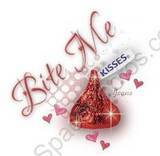 Hershey's Kisses were created in what year?